1. Cook the dal with water and turmeric. 2. Add the tomatoes and cook till tomatoes are pulpy. 3. Add the spinach and cook for 2 minutes. 4. Add salt, stir well and keep aside. 6. Fry the onions till golden brown. 7. Add the ginger garlic paste and simmer for 30 seconds. 8. Add the green chilli, cumin seeds, mustard seeds and curry leaves. 9. When the mustard starts spluttering, pour it over the dal. 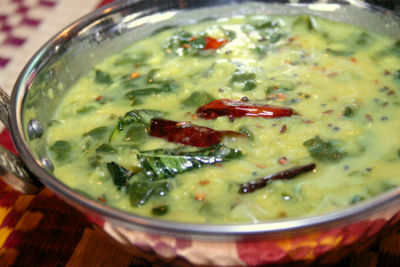 Feel free to comment or share your thoughts on this Masoor Dal with Spinach Recipe from Awesome Cuisine.